Your iPhone has become the epicenter of your work and social universe. And if you can keep your iPhone in your pocket, on your desk, or across the room and still send and receive calls from it, so much the better. This is the core idea of Emiel Janson’s Dialogue, which establishes a Bluetooth connection between your iPhone and your Mac, which acts a Bluetooth headset. Once a Bluetooth connection has been established and a call has been made or received, you can talk through your Mac’s internal microphone or through a pair of headphones with a built-in microphone. This is complimented by quick access to your Address Book contacts and a call recording feature that unfortunately was not functional in OS X Mavericks at the time of the review, though the developer has stated that a fix is in the works. Dialogue is functional, but needs some streamlining. It’s easy enough to pair your Mac to your iPhone via Bluetooth and Dialogue offers a convenient means of doing this (just click the Connect or _Disconnect button). Once connected, give Dialogue access to your Contacts list and it’s a cinch to click on the Dialogue icon in the menu bar, begin typing a contact’s name, and then click their name to begin dialing. 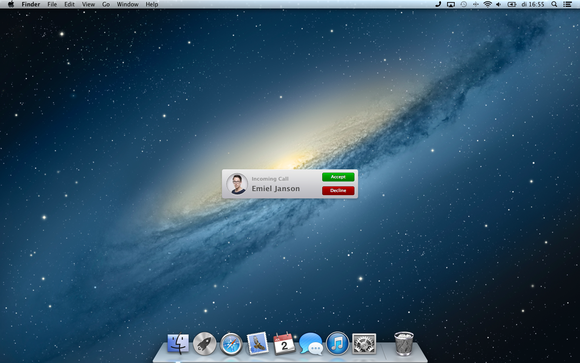 Receiving a call is just as easy and Dialogue will put up a notification icon in the center of your Mac’s screen asking if you’d like to take the call or ignore it. Once you accept the call, begin speaking at a normal volume and the call sounds as good as it would through any conference call system. While Dialogue adds a great level of connectivity between your Mac and your iPhone, there are some shortcomings to contend with. Beyond the current lack of a workable recording feature, Dialogue seems to hijack your Mac’s user interface and it becomes tricky to click around an open call session window and into an application running behind it. This is compounded by a dialing issue, where it would occasionally be impossible to dial a telephone number through Dialogue and I had to enter the phone number on the iPhone itself. Finally, Dialogue’s help menu points to the company’s website, which shows only the most basic setup features and a marketing video that shows off the functionality of the program as opposed to anything similar to a support forum or FAQ list to help you. While Dialogue’s core strength—that of being able to send and receive calls from your iPhone from your Mac through a Bluetooth connection—is robust enough to make you wonder why Apple hasn’t built a similar feature into OS X, its shortcomings detract from what could be an amazing application. Its potential is there, it offers something genuinely useful, but it’ll need some debugging and polish to make it great. Dialogue has a few shortcomings, but its basic functionality—connecting your iPhone to your Mac so you can use the Mac as a "headset"—works well.